Paul formerly worked for 22 years in the Agricultural/Dairying Industry. Most recently he was a Farm Liaison Officer with Lakeland Dairies (N.I.) Ltd, based in Omagh, with responsibility for managing advice, milk collection and payment to 250 milk suppliers. He also worked with Milk Processor Nestle UK Ltd in Omagh for 6 years in a similar role before Lakeland Dairies bought the business in 2002. 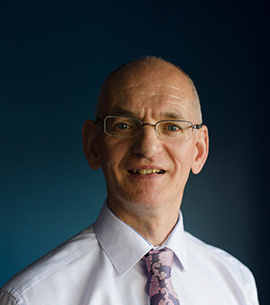 Prior to returning to Northern Ireland in 1996, he spent 10 years in Wales working for the Ministry of Agriculture, Fisheries and Food (MAFF) as a Dairy Consultant, where he specialised in Dairy Hygiene, Milking Technology and Farm Business Management. Paul graduated from Queen’s University Belfast in 1985 with an Honours Degree in General Agriculture and completed a Queen’s University Diploma in Agricultural Communication (with distinction) at Loughry College, Cookstown the following year. He is currently studying part-time in South West College on the Foundation Degree Course in Rural Land Use, Environment and Sustainability.